The formula: One dog + too much food + too little exercise = canine obesity. If you want your pet to live a healthier, longer life, it's time to evaluate her physical condition and her diet. The trend is disturbing. As America grows fatter, our dogs are growing fatter right along with us. According to statistics provided by the Association for Pet Obesity Prevention, about 54 percent of dogs in the United States are currently overweight. Why the trend? Food is abundant, and people want their pets to have the best available. However, some of the "best" dog food is higher in fat for canine performance, and most of the Rovers and Fidos eating it don't receive near the amount of exercise needed to burn the excess calories. Add in all those fun grocery store doggie snacks and those plate scrapings from dinner, and dogs receive far more calories than they could ever work off in a single day. As a matter of fact, adult dogs have about the same calorie requirements as humans, about 1,300 calories a day. The amount may vary slightly between toy breeds and large breeds, but that's really all it takes to maintain an adult dog at a healthy weight. In fact, small dogs are considered the most likely to become overweight due to their lifestyles. Toys are often pampered because they are so little and cute. They are frequently carried instead of allowed to walk on their own, and since they are most likely sitting in their master's lap during snack time, they get to share those Doritos and cookies too. A number of health problems can be directly traced to the effects of canine obesity. Let's examine a few of the most prevalent and how they affect your dog. Fat cells clog arteries and valves in dogs, just as they do in humans. As these vital pathways narrow, the heart has to work harder to keep blood and oxygen flowing, leading to an enlargement of that muscle which makes it less efficient. Left unchecked, heart failure becomes imminent. Just as in humans, a liver clogged with fat cells is unable to efficiently filter toxins out of the blood stream for elimination. Eventually the liver completely fails to function and death soon follows. Carrying excess weight puts undue strain on a dog's bones and joints. The cartilage in the joints wears thin, leading to bones scraping painfully against bone. Dogs suffering from this malady will move stiffly and slowly, especially after getting up from a nap. 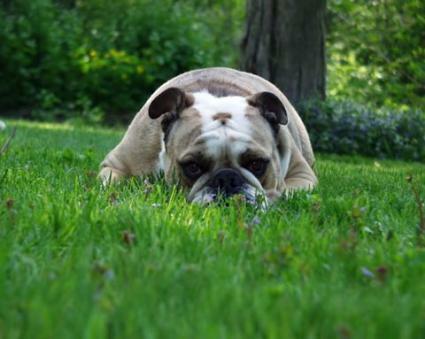 Canine Hip Dysplasia, and Arthritis are two of the most prevalent skeletal stress disorders related to canine obesity. The connection may not seem obvious, but cancer rates increase dramatically for obese dogs. The problem seems to lie with some of the preservatives currently used in commercial dog foods. Butylated hydroxytoluene (BHT), butylated hydroxyanisole (BHA), and ethoxyquin are used extensively, even though they are known cancer causing agents. Canine diabetes is a serious disease that affects your dog's ability to metabolize sugar. The pancreas is either unable to produce enough insulin to break down the sugar molecules, or the body is unable to properly use the insulin that is produced. Higher levels of sugar in the bloodstream can feed even the most minor bacterial infections, turning them chronic and life threatening. Studies show that maintaining a healthy weight lessens the effects of diabetes in dogs. You can't feel its ribs. Lack of a slight tuck up in the tummy area. Dog becomes breathless from minimal exercise. Combating canine obesity is the same for dogs as it is for humans. Feed an appropriately balanced dog food that is geared toward your pet's age group and serve it in two small daily meals instead of overloading it into one. This will allow your dog's system to digest it more efficiently. Cut out calorie-laden between meal snacks. If you must give your dog treats, choose healthy snacks such as K-9 Fat Free Dog Treats or Healthy Baker Lite Dog Biscuits. Make sure your dog gets daily exercise. A simple walk around the block once a day provides low impact exercise, perks up the metabolism, and helps your dog shed excess calories. It won't hurt you either!